UPDATE: Interstate 5 has been re-opened between Redding and Mount Shasta. Lane closures are in effect for repair work. Use caution in the area. SHASTA COUNTY, Calif. – The Delta Fire is once again forcing the closure of a part of Interstate 5 in Shasta County, California. 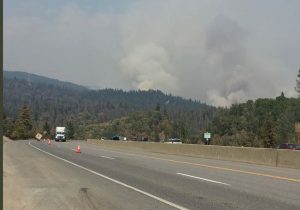 At about 3:15 p.m. Thursday, Caltrans announced that a “flare-up” of the fire prompted the complete closure of a stretch of I-5 between the community of Mount Shasta and Lakehead. According to Caltrans, the highway was closed northbound at Fawndale and southbound at Mott Road. I-5 has since re-opened. Travelers are advised to avoid the area. As of the morning of September 13, the Delta Fire covered 58,427 acres at 17% containment. 17 structures have been destroyed.